We all know the smoke grenade feature in Tanktastic, right? But do we also know how to use it effectively? 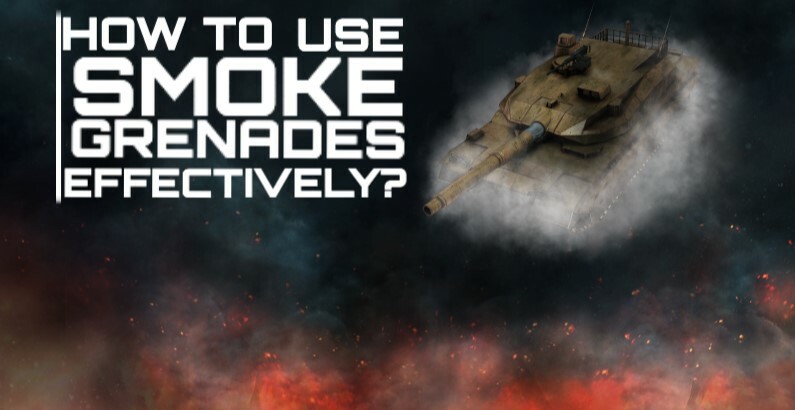 In this small tutorial, you will read how to get the most out of your smoke grenades in various situations! In real life, a smoke grenade launcher is a cluster of smoke grenades together, which when fired will create a smoke screen in the direction it has been shot. Smoke grenade launchers are also known as smoke dischargers and are attached to most modern vehicles. Said smokescreen can provide cover for a tactical move or other actions. 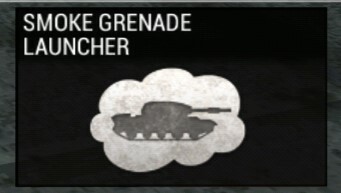 You can upgrade the smoke grenade launchers’ level as well, but this depends on what tank you are driving. When you first buy it, it only will allow the use of it, but the upgrades after this will increase the recharging time. It is very important to know that the smoke grenades will be launched in the direction your turret is facing! The smoke grenade launcher plays a big role in defending your tank against ATM (Anti-Tank Missile) fired by an opponent. It can both interrupt a locking process and distract the ATM so it misses its target. Before an ATM can be fired, it must have locked onto its target, which takes 3.5 seconds. It is easy to know if you are being locked; a small white lock-symbol will flicker red and white when you are being locked. There will also be a locking sound played, which can be heard in the video. To interrupt the lock, pop smoke out before the missile has been fired. This will cancel the lock as long as the smoke is still visible. After this, your enemy will be able to lock your tank again. Distracting a missile is, of course, possible as well. Before the ATM has been fired, you will hear the locking sound and the symbol will flash. There is no special sound effect when the ATM has been fired, which means that you will have to see it yourself. When the ATM has been fired, pop out the smoke as soon as possible to distract it, and the missile will miss its target. If you wait too long, the ATM might hit you even though you fired your smoke grenades. An advantage of distracting the missile instead of locking it is that your enemy has to wait for a new ATM to reload, this usually takes more time than the locking progress. If you fire your smoke before the missile has been fired, the other player will be able to lock and shoot again if the smoke screen disappeared (and if you didn’t find cover). The smoke grenade feature can also be used for battles in close quarters. Smoke can be used in a variety of situations and in some of them, a good timed smoke grenade will make the difference between winning or losing a fight. If you are in a direct fight with your opponent, popping smoke can make your enemy miss a shot and you can get back into cover. The best method to use smoke in such situations is to shoot your smoke grenades and drive backwards. Sometimes, a maneuver to flank is working as well. Be aware that popping smoke will not prevent being hit by your enemy, so if you pop your smoke, try to change course or wiggle to decrease the chance of being hit. If you are not in a direct fight with your opponent, you can use a smoke grenade as cover to get from A to B. Players cannot see through smoke, which means that they won’t see you. For example, if you are trying to get from a building to another building, but there is an enemy that is keeping an eye out for you, pop smoke and drive as fast as possible to the place where you want to go. Smoke also is very handy on long distance, most likely on large-sized maps (for example Winter, Alabino, etc). On said distances, a small move can make the difference between being hit or not be hit. If you use the smoke grenade correctly, you will stand a better chance surviving on the battlefield! When you and your opponent are in a long-distance firefight, there are very few things that will influence the outcome. Aside from the accuracy and shell type, smoke can make the difference as well. By popping smoke in front of you, the enemy will not be able to see you and will most likely continue with shooting on the exact same point. When you shot your smoke, move in any direction as long as you are not on the exact same point as you were before. If you do so, your enemy will most likely miss shots and will have to re-aim. Meanwhile, you can aim at your target and fire. You also can use smoke to get into cover if necessary, if you are being attacked by the enemy. Shoot your smoke and drive further and change course, or drive backwards to get behind an obstacle. If there is a difference in terrain height you can use this as well to get covered. Smoke is thus very useful on both maneuvering and in a firefight on long distances. The smoke grenade feature is also very handy in certain situations in certain game modes. For every game mode, there will be a few tips and examples on how you can use smoke effectively. Team Deathmatch: in this game mode, which is about killing the players of the enemy team, you can use smoke to drive into cover, flank and execute other maneuvers. You also can distract and interrupt locks and ATM’s( explained under 1.2). Deathmatch: in this game mode, which is a free-for-all game mode, you can use smoke to drive into cover, flank and execute other maneuvers. You also can distract and interrupt locks and ATM’s( explained under 1.2). Escaping from a fight or a tactical retreat with smoke as cover works out very good as well! Capture the flag: in this game mode, which is about capturing the enemy’s flag and delivering it to your base, you can use smoke to drive into cover, flank and execute other maneuvers. You also can distract and interrupt locks and ATM’s( explained under 1.2). It also is possible to pop your smoke when you capture the flag, so your opponents are confused and not sure what way you will drive away. You also can use it when you are being chased down to provide cover, but then you always need to maneuver your tank. Control points: in this game mode, which is about draining enemy’s tickets by capturing control points (A, B, C), you can use smoke to drive into cover, flank and execute other maneuvers. You also can distract and interrupt locks and ATM’s( explained under 1.2). You can also use it when you are capturing a point, so the enemies can’t see you very well. When the point has been captured, you drive backwards to get behind the point itself that will provide some cover. The smoke duration is about as long as the time you need to capture a point. When your opponent uses the smoke feature, you cannot do too much about it but try to guess what direction he/she did go. If you are able to hit the enemy, you can see the damage coming from it, and firing on that will most likely mean that you will hit your opponent. You also can wait for the smoke to vanish and see if the enemy is still there. As no one can see through the smoke, try to flank your enemy. Be aware that you and your opponent can still use the radar feature, with which you can determine your enemy’s position.